A free mailing service for travelers is becoming increasingly popular in Korea. The Seoul Metropolitan Government offers the service so that visitors can send postcards for free to their families and friends about their experiences in the capital. The designs include eight major tourist sites in Seoul. 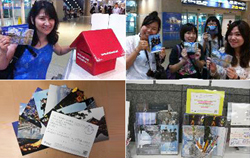 The postcards are available at major tourist information centers. A total of 33,000 were sent overseas from May to July. By nationality, 71 percent of the service users were Chinese, including people from Taiwan and Hong Kong, and 20 percent were Japanese. The city government anticipates that more than 60,000 of the free postcards will be mailed this year. You have provided very good information and this is very important. And people get very useful benefits from reading such information.